We are a leading physiotherapy clinic in Perth focusing on tailored proactive treatment for clients with chronic and back pains, sport injuries and more. Unlike other physiotherapy clinics, our primary treatment method involves instructing clients on how to move, breath, concentrate and relax. This represents an active and empowering approach to treatment, and is a deliberate move away from a model of physiotherapy focused on passive treatment. What is active physiotherapy treatment? Active treatment provided by our physiotherapists encourages patients to take ownership of their condition, and empowers them to becomes active participants in their recovery. - Highly personalised care, coaching and mentoring. What is the case for active approaches? - Active self management techniques for acute pain draw the emphasis away from the perceived need to reply on passive treatment. Any passive techniques that are actually useful can be taught to the client, to further encourage self-treatment. - Active self management avoids biomedical messages learned in the acute stage of an injury needing undoing later on. The evidence for active approaches to physiotherapy treatment is overwhelming. Our physiotherapy clinic is on the cusp of a paradigm shift within the physiotherapy and rehabilitation world, given the strength of the evidence and argument for movement based therapy. Don’t employ passive physical agents except when necessary to facilitate participation in an active treatment program. "There is limited evidence for use of passive physical agents to obtain clinically important outcomes for musculoskeletal conditions. A carefully designed active treatment plan has a greater impact on pain, mobility, function and quality of life. While there is some evidence of short-term pain relief for certain physical agents, the addition of passive physical agents should be supported by evidence and used to facilitate an active treatment program. There is emerging evidence that passive physical agents can harm patients. Communicating to patients that passive, instead of active, management strategies are advisable exacerbates fears and anxiety that many patients have about being physically active when in pain, which can prolong recovery, increase costs and increase the risk of exposure to invasive and costly interventions such as injections or surgery." Get in touch with our physiotherapy clinic today! Click on the research articles below to find current scientific evidence for treating the above conditions with yoga therapy. How do I begin a Yoga program with a Physiotherapist? It is important to undergo an initial assessment, which will cover your medical history, x-rays and scans, and as well as a comprehensive physical examination. The initial consultation lasts 1 hour. 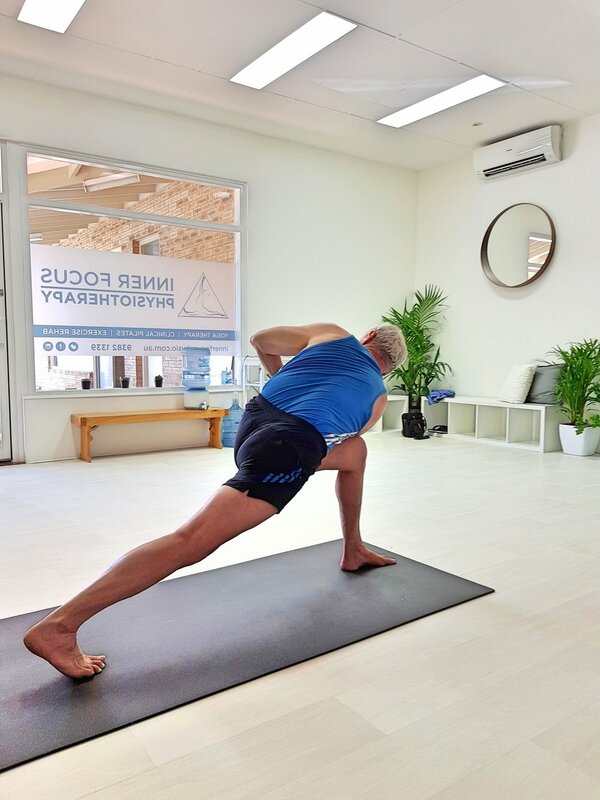 After the initial consultation, a unique, individualised yoga program is tailored to your specific needs. Patients are then able to commence either 1-on-1 sessions, or join the semi-private (3-on-1) sessions outlined in the timetable.